Reviewed! Drowning Pool - "Drowning Pool"
The farther Drowning Pool distance themselves from their past (well, besides in a live setting), the better. The sooner they realize they have little or nothing in common with their prior incarnations, the sooner they realize they are that guy (singer Ryan McCombs) that used to sing in Soil and his new band, the better they will be in the long run. They aren’t Drowning Pool, nor will they ever be again what they used to be, and “Drowning Pool” sounds as if it’s a step towards that ultimate realization. The band didn’t seem to grasp this notion on their last record “Full Circle,” but apparently they do now. 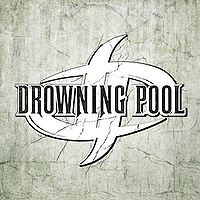 “Drowning Pool” needed to be a reinvention for the band very badly, and the record succeeds in that aspect through the use of over-the-top listener friendly songs that are easy to sink into. McCombs songwriting can be felt throughout, and Drowning Pool (no matter who the singer has been) has always rested upon the laurels of their big, guitar driven hooks and this disc isn’t any different. From the mid-80’s excess fueled feel of ‘Let the Sin Begin’ and the sorrow laden back story of ‘Feel Like I Do’ (McCombs lost his father and home and got divorced), to the Southern embrace of ‘Alcohol Blind’ and the blatant, fist in the air chug of ‘Horns Up,’ “Drowning Pool” is as important an album as the band has ever streeted. Where “Full Circle” was an overwhelmingly passable piece of work, a record that was more transitional than anything else, “Drowning Pool” does a great job in picking up the pieces, putting them back in pace, and sending the band down a new path. It’s really about time that drummer Mike Luce, guitarist CJ Pierce and bassist Stevie Benton woke up and realized they should stop attempting to replace original frontman Dave ‘Stage’ Williams (which will never happen mind you). In other words, it was about time Drowning Pool stopped trying to be Drowning Pool and started being Drowning Pool. It only took the band nearly a decade to return to some semblance of a quality rock band (2004’s “Desensitized” was close, but no cigar), so lets keep our fingers crossed that “Drowning Pool” is just the beginning of more good things to come.